I used to ask the universe for ten million dollars. It sounded like enough money to allow me to do the things I wanted to do, but I never asked myself a) where would that money come from and b) what WOULD I want to do if I HAD that kind of cash? I’ve thought of all the usual things of course; I would pay off my house, and my bills, I would travel more, and help people in need as the opportunities arose. I’ve always thought that the one and only part of Oprah Winfrey’s life I would absolutely LOVE to have, is the ability to make things happen for other people. I think everyone needs a fairy godmother; the idea that someone out there cares enough about what touches your heart to MAKE the time to help you along your path when it seems like the road may have come to an end, is an experience I have had, and I have tried to pass along. I learned that lesson from wonderful old friend of mine in Oregon who gave me $50 when I needed gas money to get to California thirty years ago. As he handed it to me, he said “Don’t worry about paying me back. Just find someone else who needs $50 and give it to them”. Like a lot of people, I used to think money would make me happy. I thought it would provide the financial security I craved and give me breathing room I needed, so the struggle to pay bills every month and come up with the cash I needed to keep my business going wouldn’t be so stressful. But I realized recently that I don’t want to work that hard to have that kind of money. I want a balance, so I’ve learned to be specific about what I want. The words DO matter, and I learned that from developing a business plan that required me to decide exactly what I wanted my business to look like, so I knew how to go about planning it. 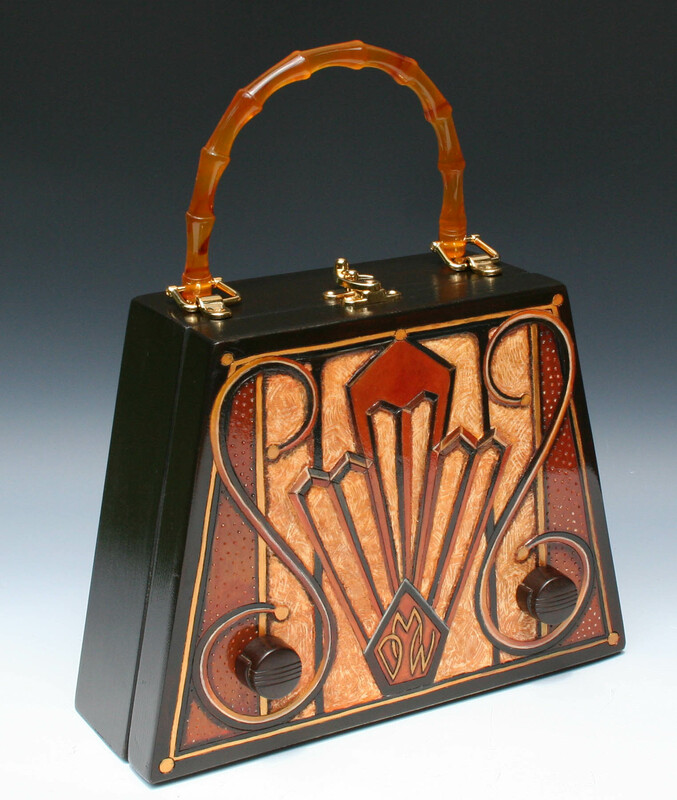 I want to sell eight to ten handbags a month to a major department store, and do four major art shows a year; the Smithsonian Craft Show, the Belleville Art Festival, the American Crafts Festival at Evanston and the Sausalito Art Festival. I want to take a month’s vacation every year. And I want to be someone’s fairy godmother when the opportunity arises. If my family had a motto when I was growing up, it would have been, “Keep your head low, don’t rock the boat and whatever you do, don’t draw attention to yourself”. When I wanted to go to college, my father told me, “What do you want to do that for? You won’t be able to use it when you are married anyway”. He wasn’t saying it to be mean. He didn’t go to college, he went to work when he was 14 years old as the janitor at a bar, and eventually taught himself how to become an auto mechanic. I have great admiration for his abilities, and I understand why he was reluctant to stand out in a crowd. When no one notices you are there, your failures, setbacks and struggles aren’t as noticeable either. All my life, I have had a burning passion to “be something” when I grew up, even though I had no idea how to go about it. Somehow I’ve managed to do everything I ever set out to do, even if I didn’t do it as successfully as I thought I could have given what I thought I had to work with. Take the film business for example. I have always loved movies and wanted to be involved with filmmaking as a kid, but I had no idea what that meant. I was about to graduate from Oregon State University with a degree in Liberal Arts, and then Mt. Saint Helens erupted. I had been corresponding with a woman who worked for Michael Douglas at the time, and she was fascinated by the fact that I lived so close to this natural disaster. I sent her a jar of ash my grandmother had, and she wrote back with an offer to help me find a job when I moved to Los Angeles, so, I packed my Volkswagon Bug and headed south to stay with a friend from college until I could strike out on my own. Since I didn’t want to be an actress, I spent twelve years reading screenplays when I wasn’t trying to write them. I was an adequate writer, and a decent story analyst, but neither pursuit was my passion. Eventually, I went to work for the Bodhi Tree Bookstore where I fell in love with some small gift gourds and once class later, was on my way toward becoming one of the best gourd artists on the planet. I had no idea what I was doing; I didn’t know how to get into art shows, or galleries, how to display, price or market gourds, but somewhere along the way, I learned that not knowing what I was doing, or how to go about doing it, wasn’t as big of a drawback as I would have thought. Ignorance really IS bliss, because I never let the word no, stop me from doing anything. I love creating art, and I am rediscovering my passion for promoting it as well. Maybe that’s because I honestly think this new collection is one of the most exciting things I have ever created. I wake up in the middle of the night with things I want to write about or handbag designs I want to develop, and the process of watching them unfold is as inspiring as developing a plan of action on how to go about becoming the “next big thing”! 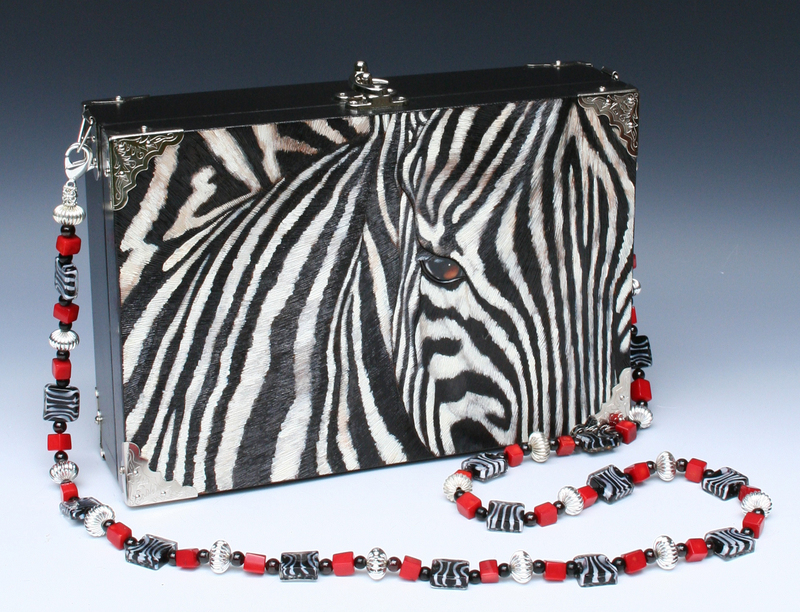 BRAND NEW HANDBAGS, Hot off the Presses!!! I was so excited to finish the new crop of bags yesterday that I neglected to post anything about why the bags are so special. 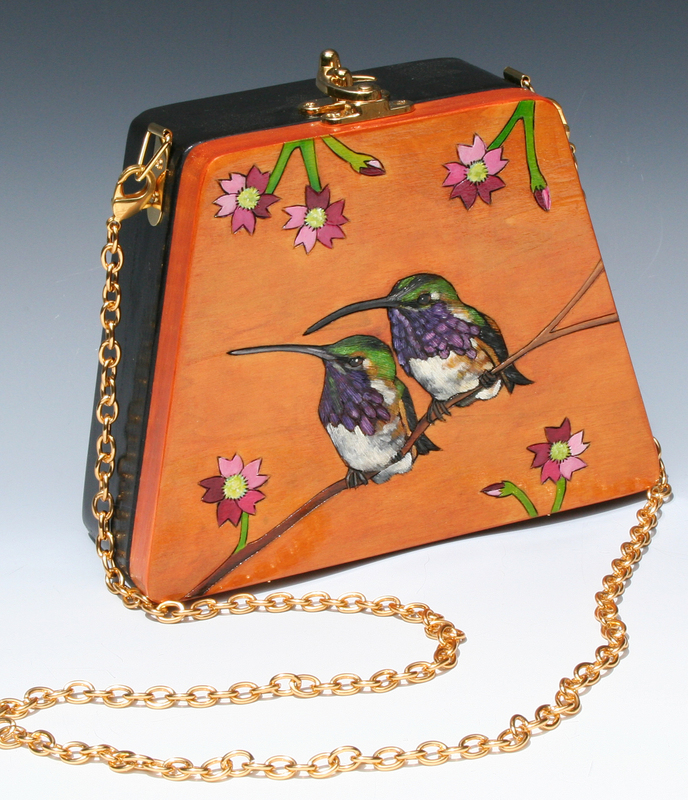 Each of the new series of bags incorporates vintage elements I found on ebay and I love that added touch. 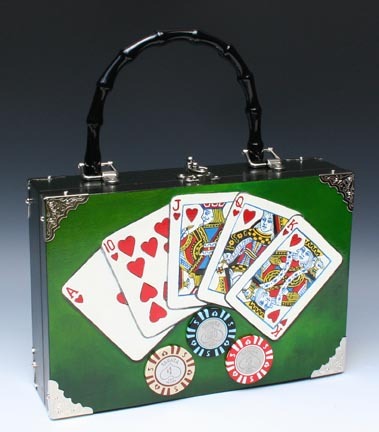 The Poker handbag, for example, has three vintage poker chips from the Sahara Casino in Las Vegas circa 1960. 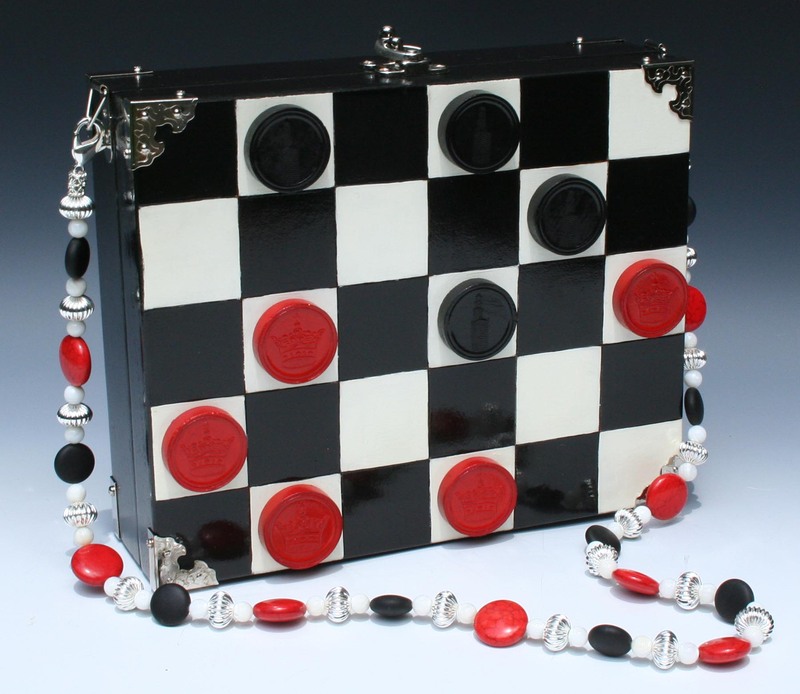 The checkerboard bag has vintage checkers, with the red, Crowns and the black, the Empire State Building. The radio has bakelite knobs and a carved grill to provide added depth. 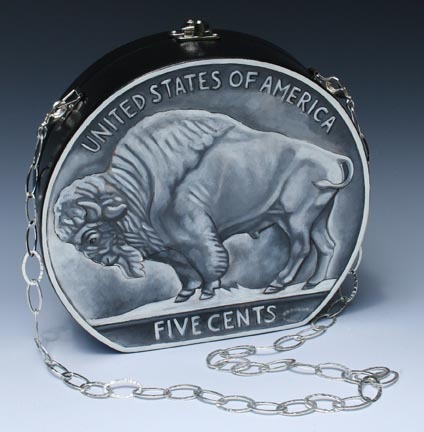 I’ve posted the nickle handbag before but thought I would add it to the line up because they look so good together. I have a few more pictures of less “whimsical” work to post in the next few days, but I really feel I am on to something here and I am delighted to see where they will go. This is going to be huge. And you read it here first…..